Mbalula lashes out at Bafana ... AGAIN! 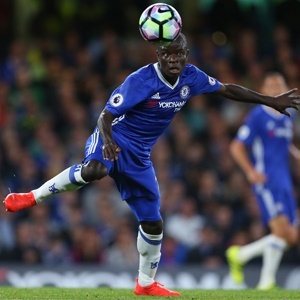 Leicester - A rare N'Golo Kante goal on his return to Leicester gave Premier League champions Chelsea a 2-1 victory at the King Power Stadium on Saturday. Kante struck five minutes after half-time with a low shot that appeared to take City keeper Kasper Schmeichel by surprise as it came though a crowd of players to find the bottom corner. It was only the French midfielder's third Premier League goal, doubling Chelsea's lead after Alvaro Morata's first-half header had opened the scoring for Chelsea. Jamie Vardy's penalty pulled one back for Leicester but the Foxes fell to their third defeat of the season, while Chelsea celebrated a third successive win. Belgian playmaker Eden Hazard was on the bench after missing the start of Chelsea's season after breaking his ankle while training with his national team in June. Chelsea midfielder Danny Drinkwater was also among the substitutes following his move from Leicester on transfer deadline day. The Blues started brightly with Morata forcing Schmeichel into a save in the second minute. Behind the Spanish striker, Cesc Fabregas was linking well with Tiemoue Bakayoko and Victor Moses while Marcos Alonso was making inroads on the left flank. The Spanish wing back almost picked out Morata with a cross from a tight angle, but Leicester captain Wes Morgan intervened at full stretch to clear the danger. It was midway through the first half before the home side got a clear sight of goal, Vardy racing onto Riyad Mahrez's through ball and dragging his shot past the far post. At the other end Morgan was again called into action as Kante won the ball and set Morata away. The Jamaica international slid in to send the Spaniard's shot out for a corner. An uncharacteristic mistake from Kante, who gave the ball away from a short corner, almost cost his side as Mahrez broke. The Algerian charged towards the Chelsea goal ignoring the run of Vardy to pick out Islam Slimani, but his weak shot was swatted away by Thibaut Courtois. And a minute later Leicester were made to pay as Cesar Azpilicueta's looping cross was met by Morata, who guided a powerful, downward header past Schmeichel and into the bottom corner in the 41st minute. Leicester tried to hit straight back with a flurry of half chances from a corner but ran into some committed Chelsea defending. Craig Shakespeare reacted by bringing on Andy King and Demarai Gray at the break with Marc Albrighton and Slimani making way. Within five minutes of the restart the home side had fallen further behind, Kante firing home from 25 yards. The two-goal lead lasted for quarter of an hour when a penalty offered the hosts a route back into the match. Vardy seized on Azpilicueta's weak back pass and was brought down by Courtois, who gave referee Lee Mason no choice but to point to the spot. The England forward converted the chance with a viciously struck penalty straight down the middle of the goal. Shakespeare brought on Kelechi Iheanacho off the bench as his side searched desperately for an equaliser. But it was Chelsea who went closest to another goal as Hazard picked out Willian whose shot rolled inches wide.